Here are two photos I took in November 1964 at The Square in Bournemouth of one of the corporations unique Daimler Fleetlines fitted with bodies by MH Cars of Belfast the only bodies by this manufacturer delivered to the UK mainland they were part of an order for similar buses being built for Belfast Corporation at that time but diverted to Bournemouth who were suffering a vehicle shortage, registered ALJ 340/41 fleet No’s 40/41. Reported by Buses Illustrated magazine as being delivered in Belfast livery but repainted before entering service, does any one know what happened to them after they left Bournemouth? I may be wrong but I think MH Cars later became Potters who in turn became Alexanders (Belfast). ALJ 340B has been preserved, initially at Mallard Road, but the 2012 PSVC listing gives her at Winkleigh. An interesting purchase by Bournemouth. I suspect that Alexander had been involved with MH Cars all the way down the line, as this body style is very much like those supplied by Alexander to Newcastle in 1964. It’s not a particularly pretty bus, but it’s not quite as bad as the first Alexander Atlantean body. Sheffield had just one, 369. My favourites are outside the scope of this forum – Sheffield’s Voith/AN68s with peaks on the Alexander body (with flat screens upper and lower). It always been rumoured that these two Fleetlines were diverted from an order for Belfast Corporation Transport. 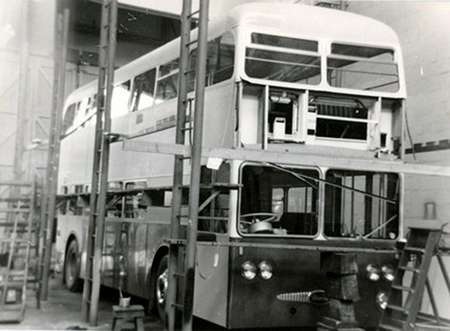 I am not sure the source of this but the two Bournemouth chassis numbers bear no relation to the batch of 150 Fleetlines which Belfast ordered even though they were built in between the two batches. The chassis numbers of 40/1 are concurrent with the CRU batch but not any Belfast vehicle. I believe they were built at the same time and may have been to a virtually identical specification to Belfast’s vehicles. I have also seen it reported that they were delivered in Belfast red but have never seen a photograph of either in this scheme and I am sure someone would have taken a photo on such an unusual event. I have a photo of the ex Belfast Fleetlines in the Bournemouth body shop in Belfast livery having the destination screen layout altered to Bournemouth’s standard pattern, prior to painting in Bournemouth livery. So these two buses definitely arrived in Belfast livery. Could you post it, David? I visited Winkleigh on the 7th October 2012 where many of the preserved Bournemouth buses are now stored. I’m certain the bus on the right of this photo is Daimler Fleetline ALJ 340B referred to by Pete Davies. David, I would love to see the "delivery" photo of the MH Cars Fleetline at Bournemouth in Belfast red. I believe I have finally got to the bottom of the mystery. What became Bournemouth 40/1 (ALJ 340/1B) were nothing to do with a Belfast Corporation order which is why their chassis numbers don’t tally with any Belfast vehicles. The chassis were originally destined to be bodied and delivered as demonstrators to Coras Iompair Eireann in Dublin for a trial. It appears that Leyland objected quoting an unwritten agreement between CIE and Leyland and the proposed programme was abandoned. Bournemouth was struggling for new vehicles because of a strike at Weymanns in which the CRU xxxC batch were caught and these two "complete" vehicles were offered and sold to Bournemouth. The fact that the chassis numbers immediately precede the Bournemouth batch appears to be coincidental. So it would appear that the mystery is finally solved. One further question for David – did 40/1 (ALJ 340/1B) arrive on trade plates or did they have Northern Ireland registration numbers on them? My brother and I grew up in Bournemouth in the 1970s having moved from Bury (Lancashire). We were overwhelmed by the difference between the Bury Corporation/Selnec Fleet and that of Bournemouth. The Bournemouth Fleetlines and Atlanteans were modern, bright and impeccably clean compared to the Leyland Titans of Bury/Selnec. We lived on Route 17 which seemed to always get the newest vehicles. We were amazed when we first saw the two MH cars bodied buses and grew fond of them because of their quirkiness. We didn’t see them that often though and I think only travelled on them once or twice. Our favourites were the CRU … C batch of open toppers on Route 12 which followed the same route as Route 17 in Alum Chine. We sometimes tried to use them coming home from school but the drivers refused to accept our bus passes on that route!! Yes that’s right Jonathan. They put on a special service in the morning at about 07.35 to take the kids who lived in Alum Chine/Westbourne to the Square to catch the normal service route 29/32 to Charminster to be at East Way at 08:15 for school start time at 08:20. School finished at 15:25 and if we were quick to catch the 15:28 from East Way to the Square in time to get the 15:45 route 17 back to Westbourne and Alum Chine. It was quite a rush in the afternoon I can say!! The whole point of the staggered school start times was so that one batch of buses could do 2 school runs thus reducing the total number of buses needed. I grew up in Bournemouth during the 1960s/early 1970s, and remember 40/41 when they were new. They were used on route 1 to Christchurch in their early days. Unfortunately, I lived only a mile from Bournemouth School and was envious of those boys who got two (or more) bus rides a day as part of their education! At primary school we did have various bus rides for swimming, etc, but these never involved 40/41 and in fact I do not think I ever rode on them despite being a frequent user of buses for getting around the town. As David R points out, there was a close relationship between the Corporation and the Education Dept. at The Town Hall – all our local journeys for school purposes were undertaken in Corporation buses. Ah yes the trips to Stokewood Road Swimming Baths. IIRC we had the Leyland Leopards for some of those journeys! I also think we used a Roadliner from time to time. The only time we used another "firm" was when we used Shamrock and Rambler for the CCF (Combined Cadet Force) journeys to Portsmouth and elsewhere. I was born in Boscombe (Hospital) sixty years ago and for the next twenty one years lived in Barrack Road, Christchurch, with the passing Bournemouth Corporation buses, trolley buses and the green Hants & Dorset Bristols. Before the introduction of the rear engined Daimlers I remember seeing a white and blue version in use. Does anyone know if it was a trial unit or does this have any bearing on the ‘Belfast’ debate? Bournemouth had the Daimler Fleetline 7000 HP demonstrator on trial for a while – which was in a blue livery as I recall, and had also had the Alexander bodied Leyland Atlantean in the Glasgow orange livery on loan as well (SGD 669). Also tried at about that time was 7552 MX, an AEC Renown demonstrator, which was in a blue and white livery. 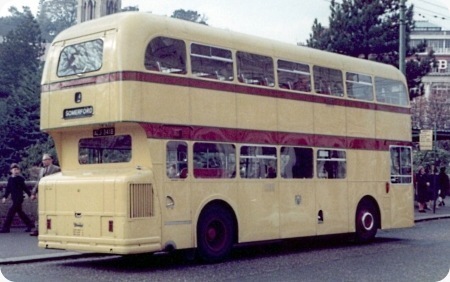 In the event, Bournemouth ordered Fleetlines and Atlanteans with bodies by Weymann (who had been body supplier for the postwar trolleys), but with a front end very similar to the Alexander demonstrator. My understanding at the time was that delivery of the completed vehicles was somewhat protracted – problems at Weymann’s I believe – and hence two MH Cars bodied vehicles were obtained to the Belfast design (and apparently they were vehicles already completed for the Belfast order). They definitely lacked the ‘style’ of the vehicles Bournemouth wanted, but were a ‘stop-gap’ measure by the transport department who wanted new vehicles urgently . The two Bournemouth MH Cars bodied vehicles were not "part of an already completed order for Belfast". They were built as a joint venture between Daimler and MH Cars and MH Coachworks to supply a fully "Irish built bus" which they could offer to CIE. The plan was to give two Fleetline to CIE on extended demonstration. The two chassis 60929 and 60930 were built long after the second batch of Belfast chassis (which had been 60644-60706)and were supplied to MH in CKD form to be built up in the MH factory at Dunmore in Belfast. Knowing that Belfast was successfully running 150 Fleetlines already 60929 and 60930 were built to full Belfast specification and were even painted in Belfast’s red and cream livery. In the meantime Leyland having got wind of the proposed deal for CIE to have two MH Cars Daimler Fleetlines on extended demonstration, cited an agreement between Leyland and CIE. To meet CIE’s needs and to get vehicles immediately, Leyland cobbled together a group of Atlanteans from Bolton, Glasgow and Liverpool and dispatched them to Dublin. At the time Daimler were aware that Bournemouth’s forthcoming batch of Fleetlines were bogged down in an industrial dispute at Weymanns and did a deal to sell them these two additional vehicles "on the cheap". This is why these two vehicles arrived in Bournemouth in Belfast colours and to Belfast specifications. The one thing I cannot ascertain is – did they arrive in Bournemouth on Northern Irish number plates or did they arrive on trade plates? David Chalk said he had photos of them on delivery but hasn’t uploaded them and I am not aware of any other photos of the pair pre-delivery. I hope this clarifies the background to these two vehicles. Thank you to Bill for clarifying the background to this – I had missed seeing his earlier post (having answered the comment about blue & white demonstrators) – the MH bodied ones certainly ‘appeared’ to be standard Belfast buses at the time! The sequence of chassis numbers, though, is ‘interesting’ – I seem to recall that order books / chassis registers for Daimlers of that period survive in the Coventry Archives. Just found this page and can add some information re; surviving examples of the 1965 Daimler Fleetlines. Of the open-top batch (180-189, there are 3 known survivors all of which are driveable but undergoing various form of restoration works. 184 – Owned by myself and based in Dorset and currently is having it’s upstairs floor replaced, with some frame repairs. It will be restored to Bournemouth colours. Although in good structural and mechanical condition, it’s suffered from having a lot of modifications from original spec over the years. 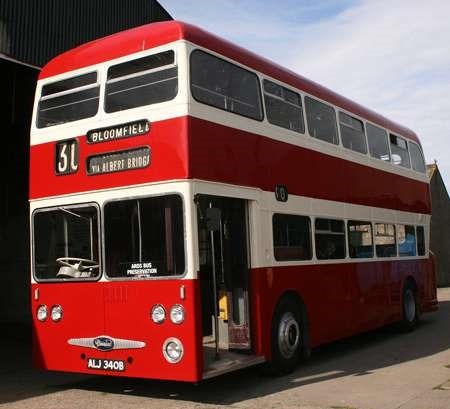 187 – Last seen residing in Sussex and will be restored to London Transport colours. Of the fixed top batch (190-199), the last known survivor was 197 but this hasn’t been seen since BPTA days about the late 1990’s I’d say. I’ve never been able to track this one down and it’s fate is a bit of a mystery. Both 40 and 41 were a diverted to Bournemouth as part of the 150 strong order for Fleetlines being bodied by MH Cars in 1963/64. Bournemouth had a pressing need for new vehicles urgently in the summer of 1964 as the Atlanteans on order were running late. Bournemouth was already in negotiation with Daimler for the 1965 delivery and it was found that two Fleetlines could be diverted very quickly. As said above, they arrived in Belfast colours and were modified and painted before use. 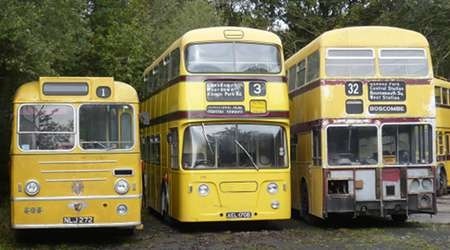 The reason that the two chassis numbers are out of sequence with the remaining Belfast buses is because Daimler issued numbers based on when orders were received and not when the chassis were built. The two received separate chassis numbers as they were ordered separately, but arrived in Belfast colours as they were intended for Belfast and would have had chassis numbers in the Belfast sequence if they had not been diverted to Bournemouth. The tale about CIE being involved is completely without foundation. Here is the photo of one of the two vehicles having its blind apertures altered to Bournemouth’s style at Mallard Road Depot in June 1964. Although already partially repainted, it’s clear that the front panel is still in Belfast Red and the windscreen surrounds are still white. I worked for Bournemouth Corporation as a mechanic from 1978-80 when I left as a result of an injury. I distinctly remember a number of the older Fleetlines (the ones without power steering) being sold to Hong Kong. They were cracking buses and were fitted with Gardiner engines and were very much more reliable than the Leyland Atlanteans which made up the bulk of the fleet. Just to update everyone 40 (ALJ 340B) returned home yesterday to Belfast and is now safely stored away pending further restoration work. This some 50 years after she was built at MH Cars (chassis assembly from Daimler kit) and MH Coachworks (bodybuilding. She is the sole remaining example of an Irish built/assembled Daimler Fleetline and the only MH Coachworks bodied vehicle preserved – there are some school bus Albion Vikings around. This handsome vehicle wears its years lightly and is well worth preserving. The Bournemouth livery and blind aperture layout only enhance its looks. Let’s hope this stays, rather than changing it to the Belfast livery. Two very fine looking vehicles indeed, enhanced even further by the lovely Bournemouth livery. I imagine there would have been some "head scratching" in order to accommodate the four sets of winding gear for the superb and informative destinations displays – I always wondered at the little "trunk road" coloured ones – "via Old Christchurch Road" etc. Pleased to hear of progress but slightly saddened she wont be based in her home of so many years. One question: why is the nearside front window slightly larger than the drivers side front window? The driver’s window had to open, unlike the nearside fitting. It must have been a very strange sensation for body builders to be carrying out such extensive frontal alteration work on brand new vehicles. Yes I though that may have been the case. What still puzzles me is that the blind apertures are the wrong way around when compared to normal. On the Weyman and Alexander bodied vehicles the number and via small apertures are nearest the nearside whereas on the MH cars vehicles the small apertures are driver side. Was it simply for ease of altering the original Belfast layout? I’m sure you’re right there David – the performance must have been complex enough without and additional "perfections." I must say that I always considered these to be two very handsome and appealing vehicles. I haven’t been to Bournemouth for perhaps almost forty years but I do remember being very disappointed from afar (Leeds) when the very unprofessional blue fleetnames were introduced. Last time I was there I was most impressed by the bus stop advertisements showing a spider’s web and the cautionary "Use us or lose us" – a sinister warning of the ever prominent declining passenger figures in the Industry. Yes when the then new "blue flash" livery was applied many of the locals were decidedly unhappy. Then they added the blue skirt which seemed to be a further retrograde step and then they introduced the brown flash livery. Personally I liked the original yellow with green and mauve band. It worked really well. As I said in an earlier post it seemed to my brother and I that the buses were kept in immaculate condition. We were also very fond of the open toppers the CRU – C batch and then the NFX – P batch. Happy memories. On the subject of "favourite batches" one group of vehicles bring back especially happy memories for me – the open top Leyland TDs. I once enjoyed a lovely ride on service 12 to Hengistbury Head – the glorious sound effects from the open top deck were pure nostalgia, and I seem to remember in particular one steep climb from the sea front where the mature deep prewar Leyland tones were pure music to my ears. Yet another question about this vehicle. 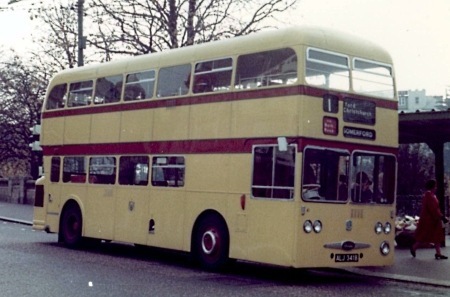 Why does it have twin front headlights as built, not changed by Bournemouth Corporation Transport when the destination layout was changed, but changed at some future point in time. On the subject of Bournemouth there is one of the Burlingham bodied Tigers currently for sale on eBay. Yes seen it is for sale. £22K. A lovely vehicle but sadly have neither the wherewithal nor the storage. Expect it to be sold by now. 40/1 were delivered with dual headlights but were later converted by Bournemouth to single sets of headlights. 40 has already been restored to dual sets and has a new front panel with a Daimler badge restored as well. Can I ask a technical question Bill? Are both headlights in a pair dip and main beam or is one main beam only? Both pairs work in tandem. Outer pair on in dipped mode, inner pair off, then all four on for full beam. Outer pair on in permanent dipped mode, inner pair come on for full beam leaving outer pair dipped. Having once had the Leyland car equivalent of the original Atlantean, the Princess, I can tell you that four standard headlamps (two full beam only) are hopeless, especially for urban driving. The dipped smaller unit gives a poorer light in most situations. If all four could be dipped other drivers would not accept this and retaliate. If these followed the same pattern, why give a bus lights designed for unlit, little used roads? Luxury cars (and many now) had a full size normal pair and two extra, smaller "driving" lights for full beam. 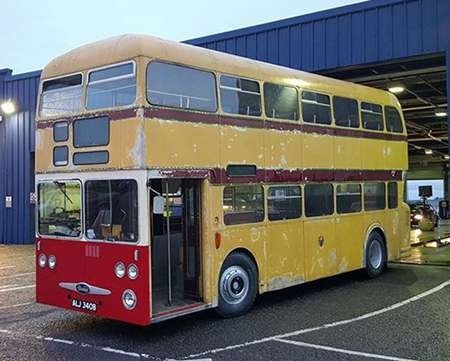 As an update I just wanted to let people know that sister vehicle 40 (ALJ 340B) which recently returned to Belfast to undergo further restoration has now been returned to roadworthy condition having passed it’s MoT. It’s a great credit to new owner Richard Shannon that so much has been done so quickly. Work continues…. Now restored to its’ original colour scheme is former Bournemouth 40 (ALJ 340B). It is fitted with Belfast Corporation destination blinds – which it never actually carried but this is the destination screen layout it carried when delivered. There is a photo on this thread showing the screens being alter to Bournemouth layout. This former unused Daimler/MH Coachworks demonstrator and its’ sister 41 (ALJ 341B) were disposed of to Bournemouth directly from the manufacturers and were never owned by Belfast Corporation Transport. 40 made its’ first appearance yesterday in Belfast in its’ original guise.